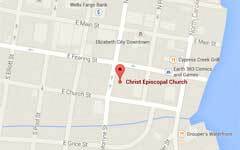 Welcome to the Christ Episcopal Church of Elizabeth City website. We hope to provide you with a snapshot of our parish life here and give you details about our worship, Sunday School, Music Program, Adult Education, Missions, and our life as a community of faith. Information about our parish staff, and our volunteer opportunities are also on this website. There are so many reasons to be searching for a parish home; a sense of belonging, an education for adults and children, a renewal in our faith life. You may be looking for forgiveness and healing or the opportunity to give thanks and share gratitude and gifts with others. Christ Episcopal Church is all this and more. It is a place that has a long tradition of being involved in the local and regional community. Many civic leaders have called Christ Episcopal Church their home parish. But, even more than this, is the fact that all persons are welcome, no matter the age, gender, race, ethnicity, or sexual orientation. We believe that we are all creatures of God, and the ground is level at the foot of The Cross; God loves us all unconditionally and favors no one. So, please come to church and see for yourself. We promise that every effort will be made to make you feel at home here; and that you will be fed and nourished by God’s truth, justice, forgiveness, and love.